The Sweeney Colliery was dug by Thomas Ireland & Co about 1836 and together with the Drill Colliery nearby began extracting coal. Between the coal seams were layers of good quality clay which was used to produce bricks and other goods such was tiles pipes etc. The Sweeney Brick works began production. By the mid 1800,s coal production ceased due to flooding, but clay continued to be extracted via the shafts. Production of firebricks and decorative tiles was undertaken at a number of local brickworks but by1860 they were transferred to the Sweeney site. 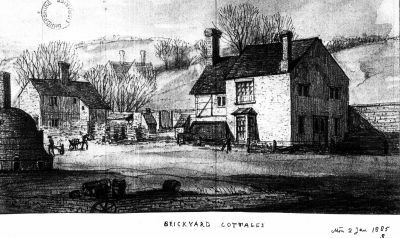 In 1872 the brickworks lease was put up for auction by the Sweeney estate landowner Stanley Leighton (1837 - 1901) as a going concern, but withdrawn and acquired by the Oswestry Coal and Brick Co Ltd who were operating the Drill Colliery and Brickworks.. The 1875 OS map shows the works with four circular kilns and two shafts but no tramways. Prior to 1880 the lease was with the Sweeney Brick Co Ltd but at an EGM on the 27th September 1889 the company resolved to be voluntarily wound up with Robert Kay of Oswestry, manager of a Brick and Tile Works appointed as Liquidator but he resigned from this role late in 1890. The lease was acquired by Kay and Hindle Ltd (no doubt the same Kay) who traded as the Sweeney Brick and Terra-cotta works. 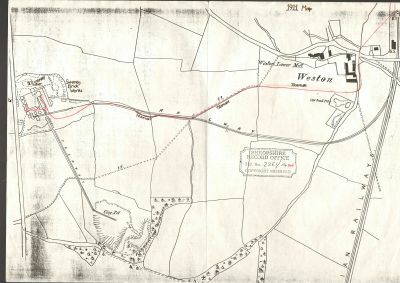 During this tenure considerable expansion was undertaken and the 1901 OS map surveyed a while earlier shows nine circular kilns along with a tramway running some 250 yards south-east from the works to an open pit worked for red boulder clay along with a longer, almost three quarter mile tramway taking a winding route from the works following field boundaries to Weston Wharf alongside the Cambrian Railways just north of the Goods Shed at Weston. It is not known when the tramways were built. The lease again changed hands to the Sweeney Blue Brick & Terra-cotta Co Ltd who on the 6th September 1899 agreed with the Cambrian Railways for a standard guage siding to be laid from just south of Weston Wharf generally westwards to the brickworks. One clause noted that the Brick Co was at liberty to use the line at a charge of one shilling per annum. Unfortunately the plan is no longer attached to the agreement and it is unclear whether the Brick Co worked the traffic or the Cambrian Railway. The high frequency of company collapse continued with the Sweeney Blue Brick & Terra-cotta Co Ltd being removed from the Companies Register in 1907 but it is not known when they had ceased trading. They were superseded by the New Sweeney Blue Brick & Terra Cotta Co Ltd who themselves petitioned to be wound up on the 24th March 1909 with the first creditors and debtors meetings being held on the 19th May that year.. A four page inventory was drawn up listing all the contents of the Brickworks for the purchase by The Sweeney (Oswestry) Brick Company Ltd and an agreement was made on the 25th September 1911 to form that new company. 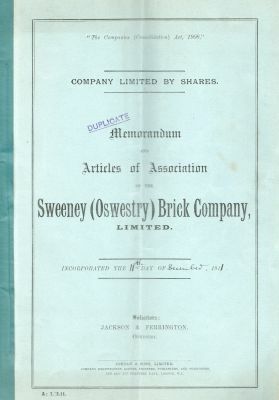 The Memorandum and Articles of Association date the incorporation to the 11th December 1911 and on the 19th December the above inventory was annotated "Recd of the Sweeney (Oswestry) Brick Co Ltd £1500 in full payment". Again life was short, at an EGM held on the 20th September 1915 the company agreed to be voluntarily wound up. According to R.D.Thomas's book " Industries of the Morda Valley", the last owner of the brickworks was the New Sweeney Brick and Tile Co Ltd but it is uncertain if the brickworks was operated by them. 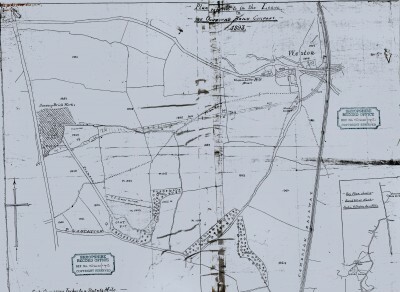 Certainly the 1926 OS map shows all the brickworks as having been removed. 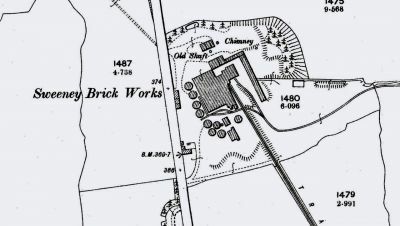 1875 map showing the Sweeney Brick works. Note at this time there were only 4 kilns in operation and no tramways. Also the clay pit had not been dug. Plan dated 1893, showing a diagram by the Oswestry Brick Co for a full guage line from Weston Wharf to the Sweeney Brick Works.. Interesting that the plan does not show it going all the way to the brick works. 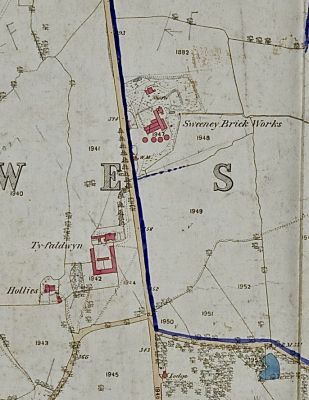 1901 map showing how the Sweeney Brickworks had expanded with 9 brick kilns in operation. 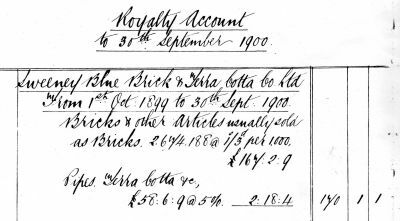 Copy of Royalty Account of the Sweeney estate showing that between 1st October 1899 and 30th September 1900 The Sweeney Blue Brick and & Terra Cotta Co Ltd, produced 2,674,188 bricks and other articles such as pipes chimney pots etc which gave the Sweeney estate £170.1s1d in Royalties. 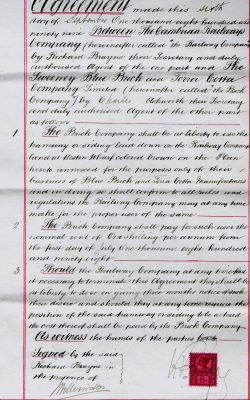 1899 Agreement between The Cambrian Railways Company and the Sweeney Blue Brick and Terra Cotta Company Ltd. for a railway line from Weston Wharf to the Sweeney Blue Brick and Terra Cotta Company on the 6th September. 1911 map showing the tramways coming into the sweeney brick works, one from the clay pit and one going to the Cambrian Railway main line at Weston Wharf.. This map also shows, the main line siding also going from Weston Wharf into the brickworks. 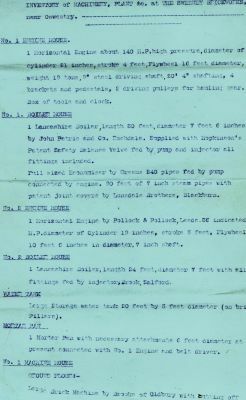 5 page inventory of the contents of the Sweeney brickyard when taken over in 1911 by the Sweeney(Oswestry) Brick Company. 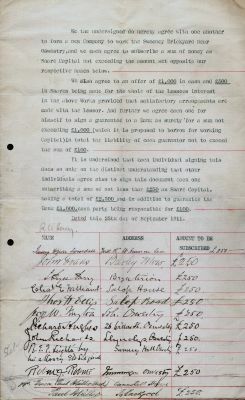 This document shows that the premises and all the listed contents were purchased for £1,500. Original agreement to form a company to work the Sweeney Brickworks. Dated 25th September 1911. This shows 11 people who formed the company, their names, addresses and the amount that they invested.. 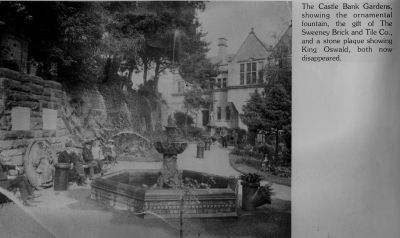 This photo believed to date aound 1900 is of an ornamental fountain which was donated by the Sweeney Brick and tile company to Oswestry Council who then positioned it near to the entrance to the Castle mound. The fountain has since disappeared and further enquiries need to be made to ascertain if it still exists. Bricks produced at the Sweeney Brick yard. These are a small selection of bricks, very many more bricks, tiles chimney pots,etc were made and when sourced , they will be photographed and added to this site. A large collection of original tiles(Approx 300) found locally which were produced by the Sweeney Blue Brick and Terracotta Co. These tiles were produced in huge numbers and were used on railway properties and can be still seen today in lots of locations. Underneath impression of one of the tiles. 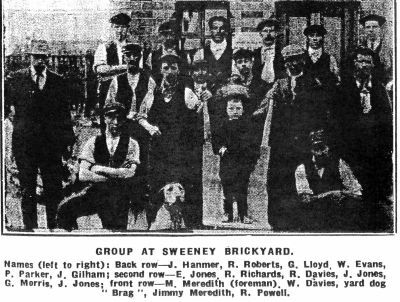 Photo of group of workers at the Sweeney Brickyard. Date unknown.